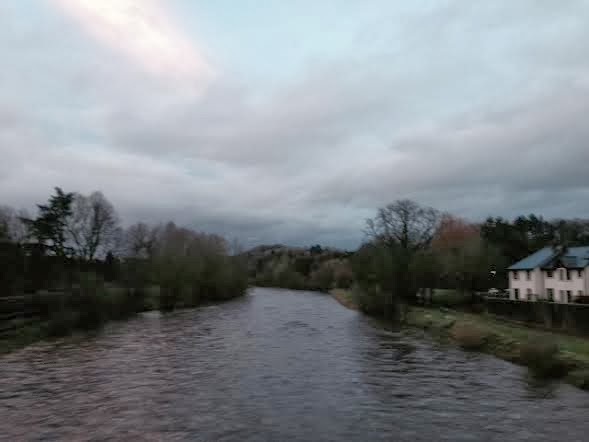 "The Walk brings me presently to a graceful stone bridge spanning the river Usk, which here so bends and curves that it is out of sight above and below, forming almost a complete circle." 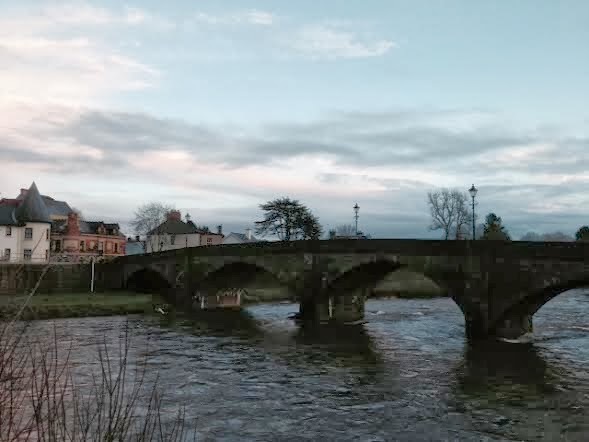 "Usk bridge is an ideal place on which to stand and stare, not at the traffic but up and down the lovely river." 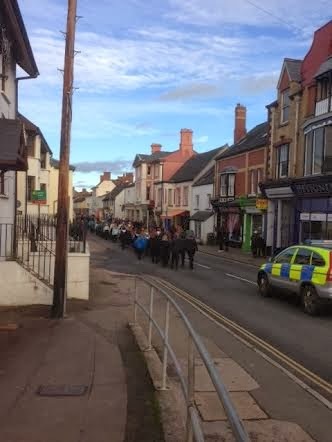 Approaching from the direction of Pontypool or Llangybi, traffic enters Usk over its bridge. 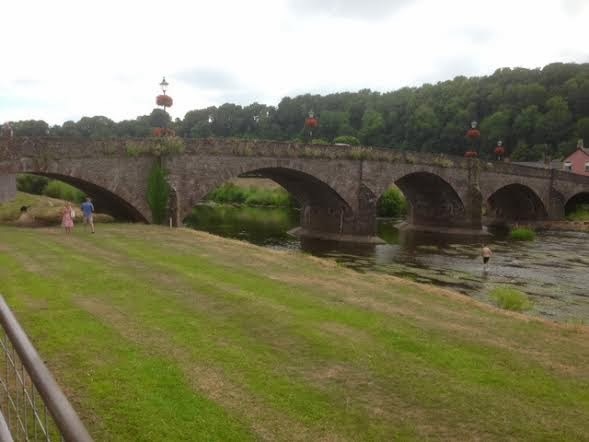 It is thought that a bridge has existed across the River Usk at this particular point from 1100. 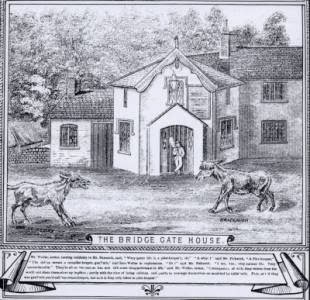 Fred Hando remarks that "The name 'Bridge Street' in ancient documents indicates that from,early days a crossing existed where the present bridge stands". 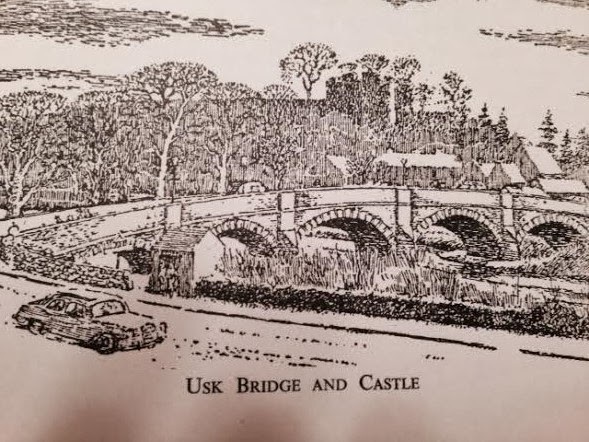 Usk historian, Geoff Mein shows evidence of a bridge across the Usk in medieval times, within the Will of Nigel Chepstow dated 1383, in which money was bequeathed for the repair of Usk Bridge. 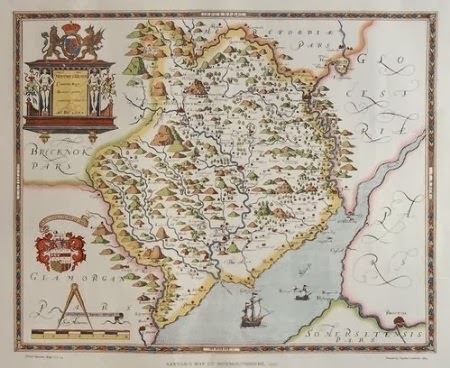 Saxton's map of Monmouthshire in 1577 shows a bridge across the river in the approximate position it is in today. 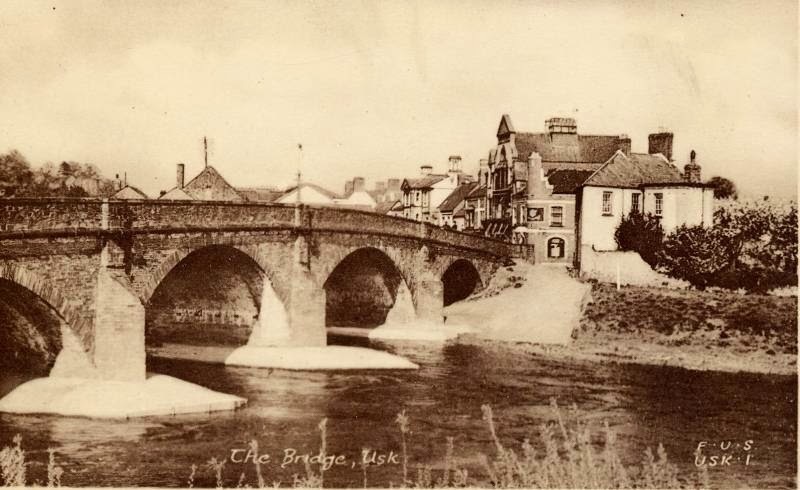 Another local historian, Joseph Bradney, who wrote extensively about Monmouthshire between 1904-1933, describes how prior to 1750, the bridge was a wooden one which got into a very bad state of repair. 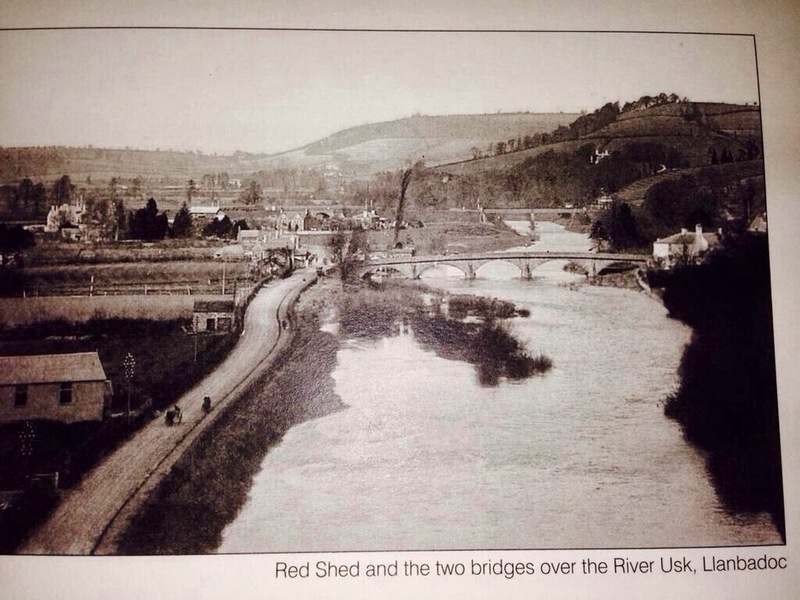 The residents of Usk petitioned wealthy local peers and landowners for a contribution towards building a new one. 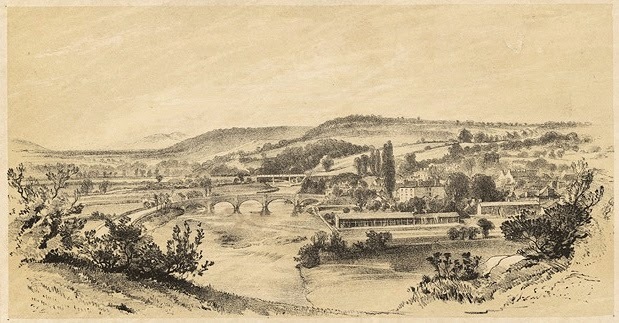 Eventually sufficient money was raised and work on the new stone bridge began, designed and overseen by church minister and architect William Edwards. It was likely completed around 1756. 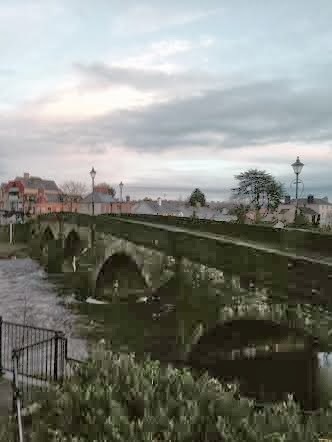 Hando refers to a copy of the 'Gloscester Journal' dated Nov 25 1755 which he had in his possession which contains an advert for a bridge builder, which states "whereas the old Wooden Bridge over the River Usk leading into Usk is quite decayed and the Inhabitants are determined to have a New Stone-bridge, any person or persons of skill or Knowledge in Bridge building....... will be treated with on that subject." 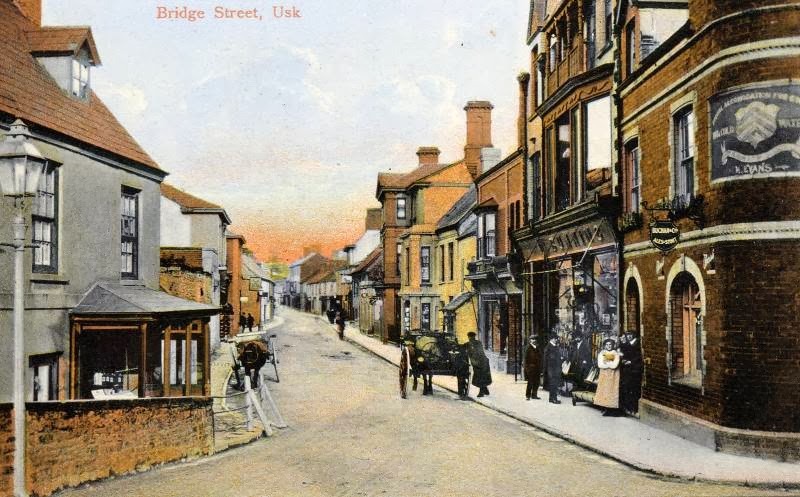 " And we Beg leave to Represent Unto your Excellency that the said Town and Burrough of Usk is an ancient Corporation And that which the publick wooden Bridge in the said Town over the River of Usk by reason of the heavy Carriages, Great Floods happening in the said River, and the carriage of Lime and Coal by farmers passing over and across the said Bridge, the same had lately gone very much into Decay and in a most ruinous Condition ......... 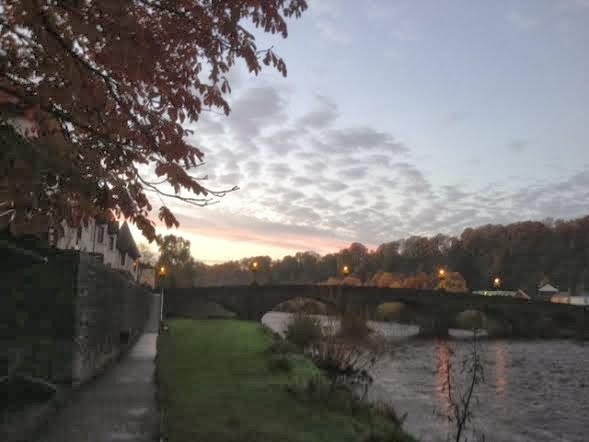 Your Petitioners were therefore advis'd to have a stone bridge built ....but... were quite unable to do so without the kind assistance of some generous, well dispos'd, and benevolent persons." 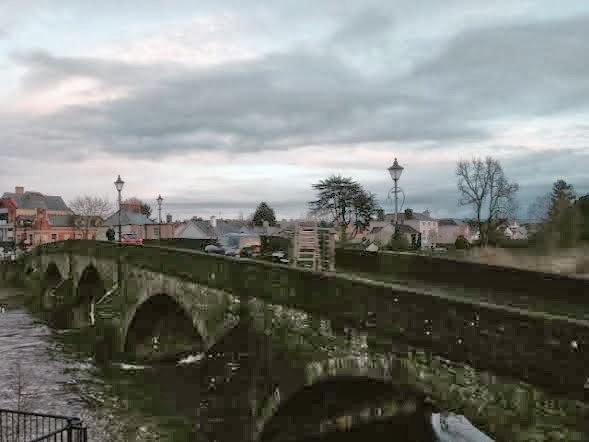 The new stone bridge consisted of five arches and was very narrow with a steep approach on either side and recesses built into the piers into which pedestrians could leap for safety. 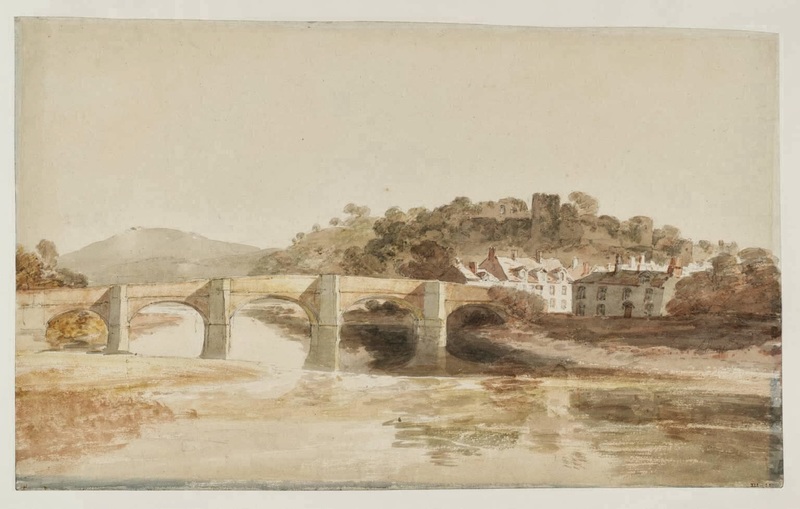 This beautiful painting by Turner in 1798, held by the Tate Gallery features the new bridge. 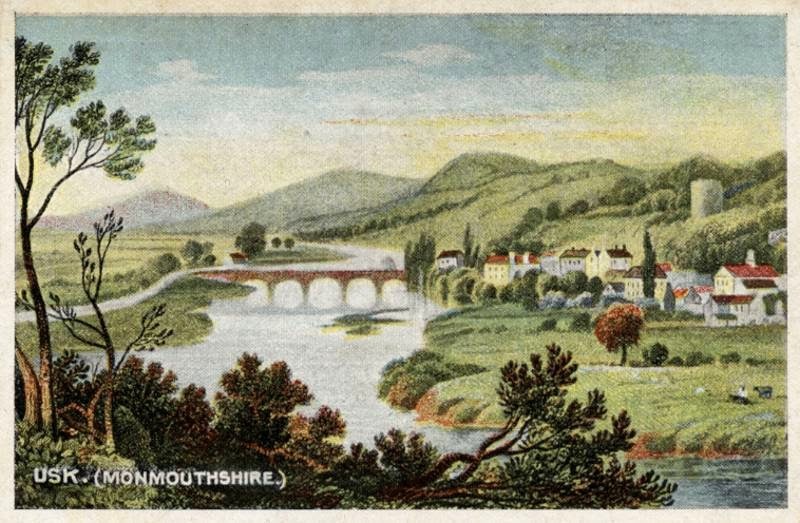 William Coxe wrote about Usk Bridge in his 'Historical Tour Through Monmouthshire' in 1801: " A stone bridge of five arches is built across the Usk, from which the mountains in the neighbourhood of Abergavenny present themselves with considerable effect". 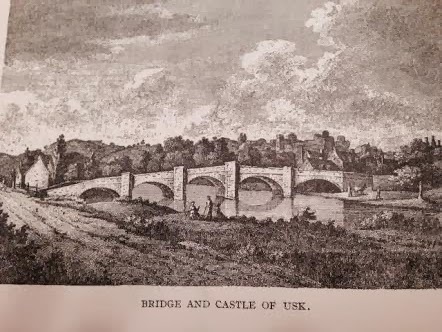 Bradney writes that by 1835, the bridge had once more gotten into quite a bad state of repair and was strengthened and widened by four feet on either side by Morgan Thomas of Lalston, during 1836. 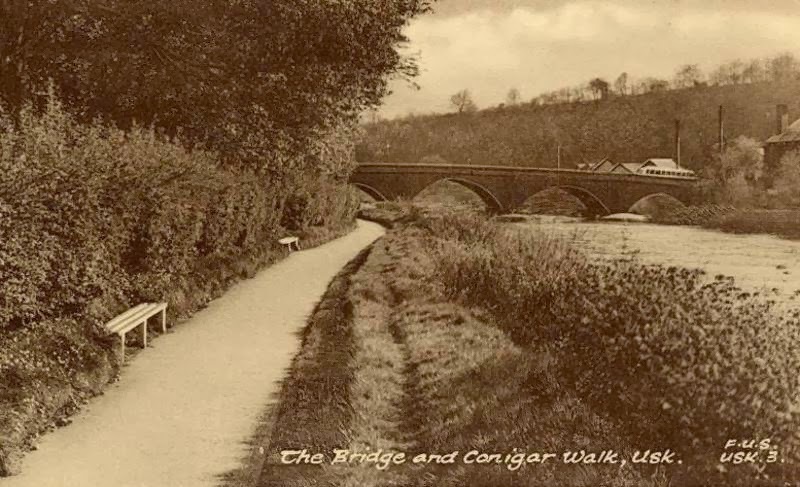 The widened bridge incorporated a footpath to improve the safety of pedestrians. 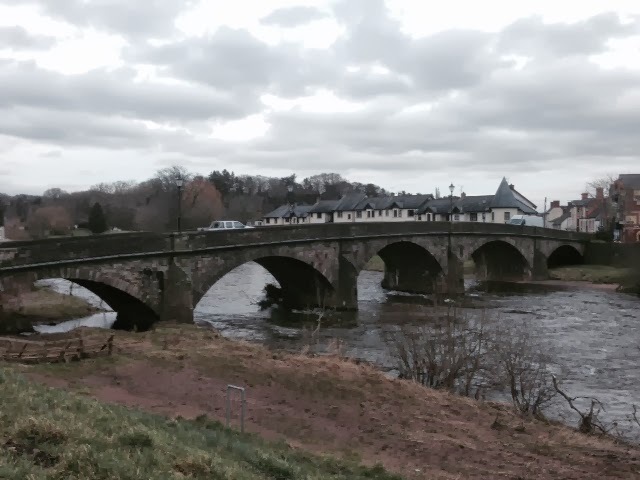 During 1877 floods destroyed two of its arches, which were later replaced. 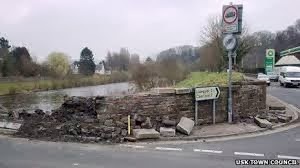 Unfortunately over the last few years in particular, Usk Bridge has suffered repeated damage to one of its corners on the Woodside, side of the river. 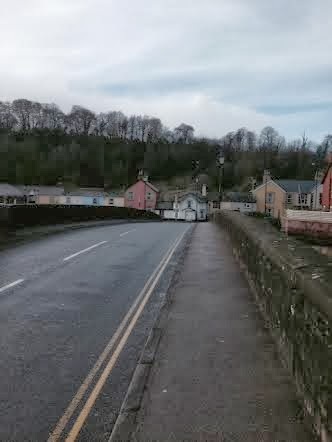 Despite there being a lorry weight restriction, some huge articulated lorries still regularly cross the bridge. 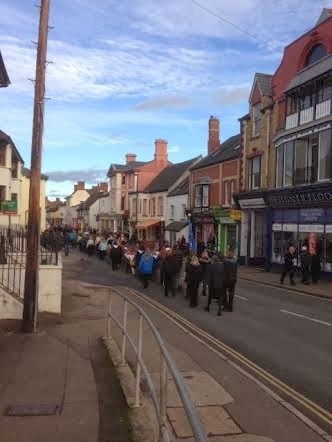 The damage is constantly being repaired with the area being cordoned off for safety, creating a single track road causing chaos and upheaval to traffic with the use of traffic lights. 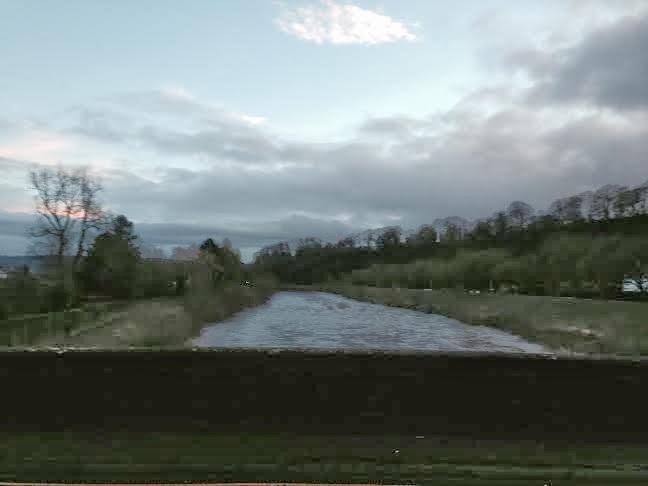 On occasion, the repaired section has been knocked back down again within days of completion. 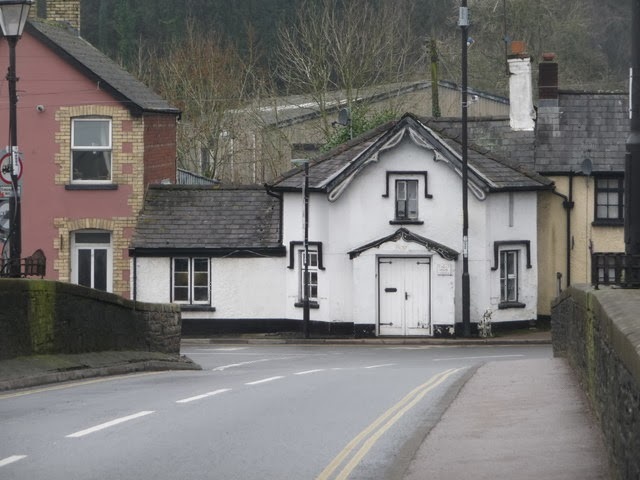 A nice feature to look out for as you cross the bridge when leaving Usk, is the old Toll House. 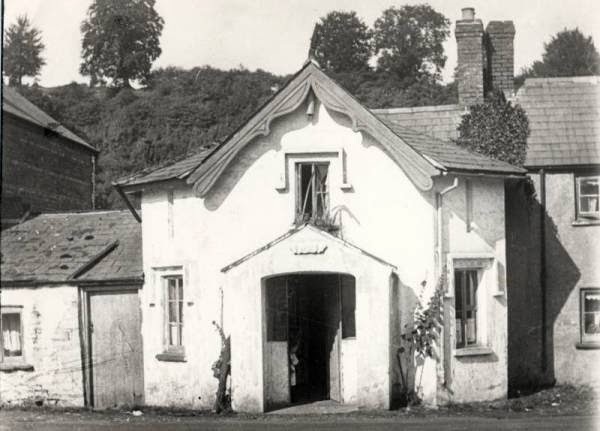 The Bridge Toll House is one of five toll gates that were set up in Usk by the Usk Turnpike Trust in around 1760 to pay for road improvements through tolls. 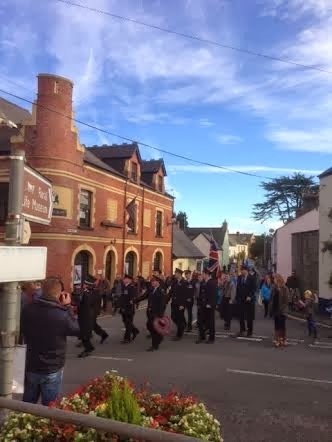 The creation of this trust was due to the work of Valentine Morris of Piercefield, Chepstow, who was responsible for promoting the first Turnpike Bill in Monmouthshire, resulting in over 300 miles of road improvements in Monmouthshire and Gloucestershire in the 1760s. 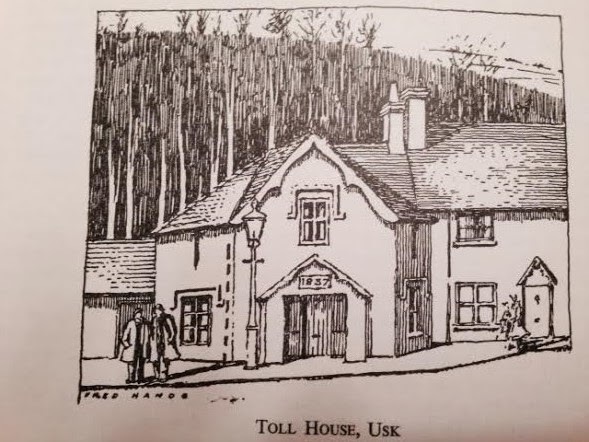 Usk Historian, David Lewis, describes a complicated system for charging tolls in 1847, with a system of varying charges made according to carriage width and nature of load and type of animal. 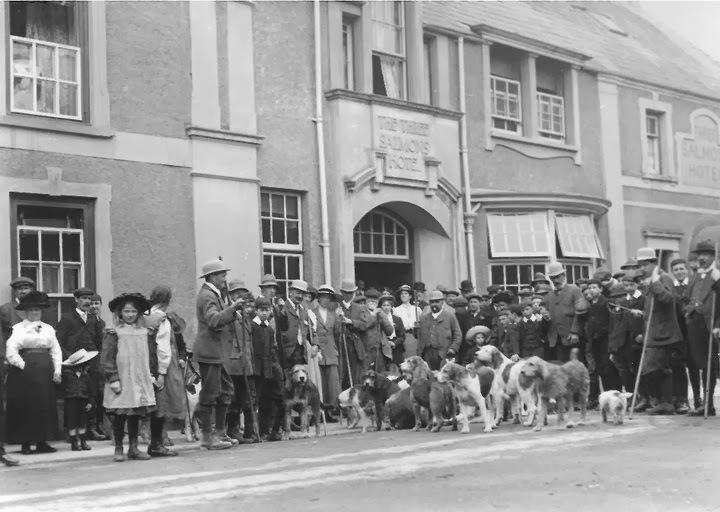 Salesmen, peddlars, horses, cattle and sheep all had different rates. 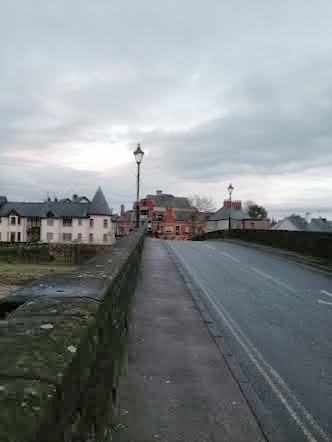 The street running off Usk Bridge is aptly called 'Bridge Street'. 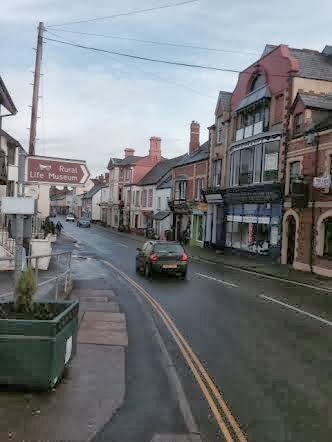 It is Usk's 'main, high' street containing most of its shops and businesses. 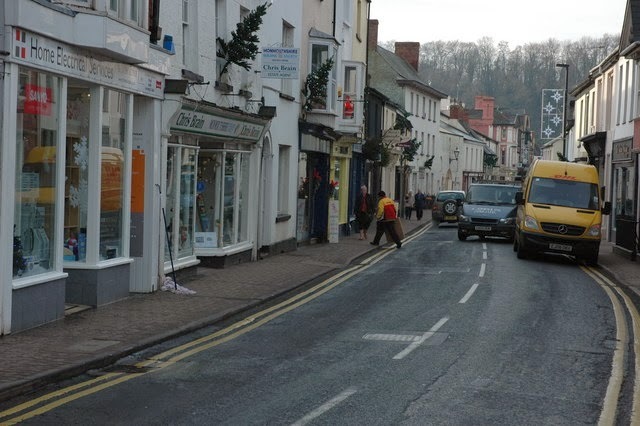 Geoffrey Mein provides evidence of the street called 'Bridge Street' in its current position in an unpublished Burgess Roll of Usk dated September 1570. 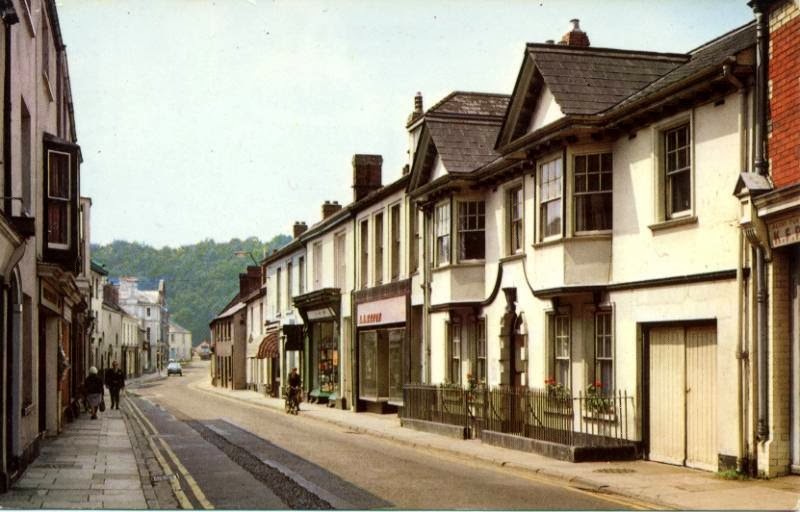 David Lewis points out in his study of Early Victorian Usk, that in the early nineteenth century there were a wide variety of commercial premises in Bridge Street, including two chemists, a grocers, a general shop, a drapers, butchers, agricultural merchant, bakery, printers, lathe cleaver, undertakers, wheelwright, watchmaker, shoemakers, building tradesmen, laundress, book sellers, a bank, solicitors and seven public houses. 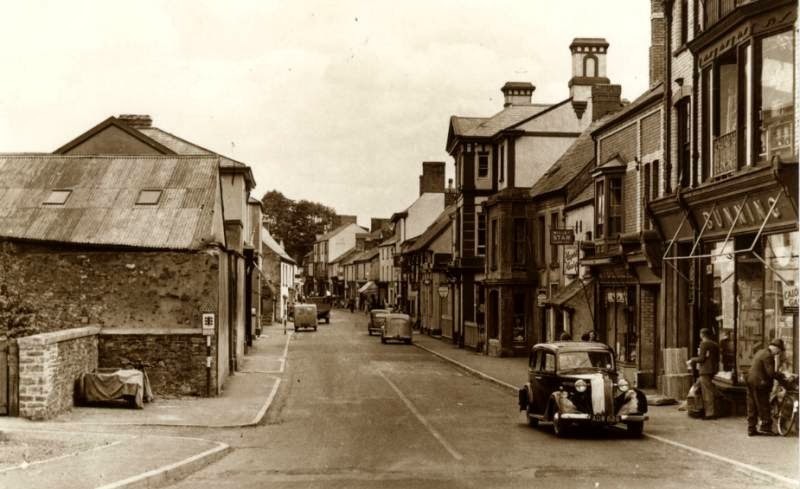 I have included some images of Bridge Street taken recently, the 1960s and back to Edwardian/Victorian times (although there are no exact dates with them you can 'guess' by the clothes and modes of transport). The oldest images are first. 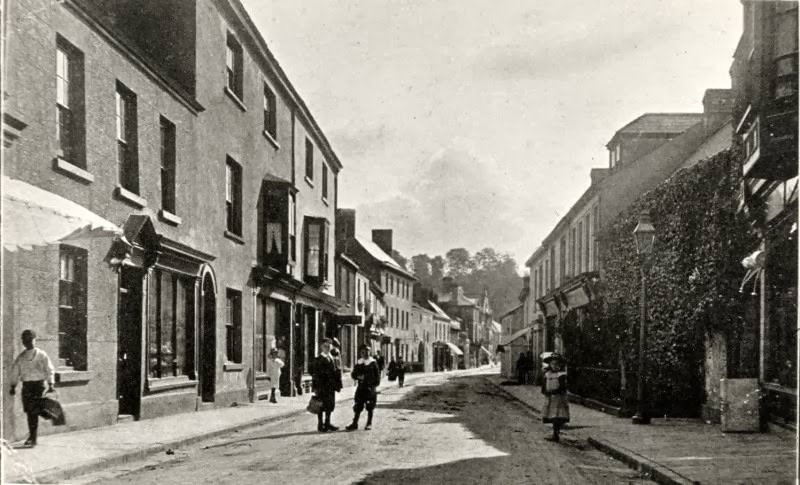 Comparing these recent photos with the older ones above them, you can see how many of the buildings in and around Bridge Street remain although they may have changed use. 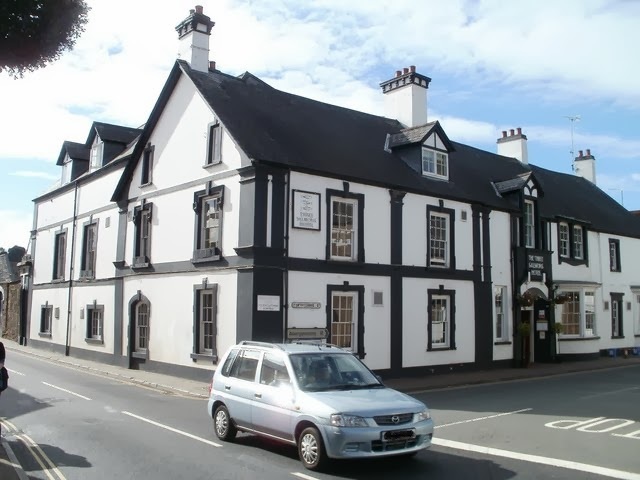 For example, what was the 'Cardiff Arms' pub (formerly 'The Pelican') is now a hairdressers, 'Burlesque'. 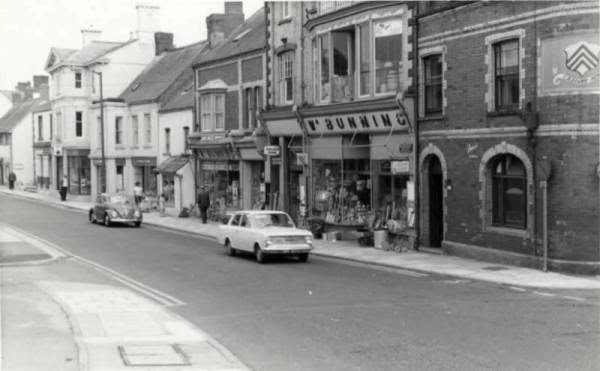 What was 'Bunning's' hardware store (formerly the site of the Japanning Works in Victorian times) is now a carpet shop, 'Designer Flooring Usk'. 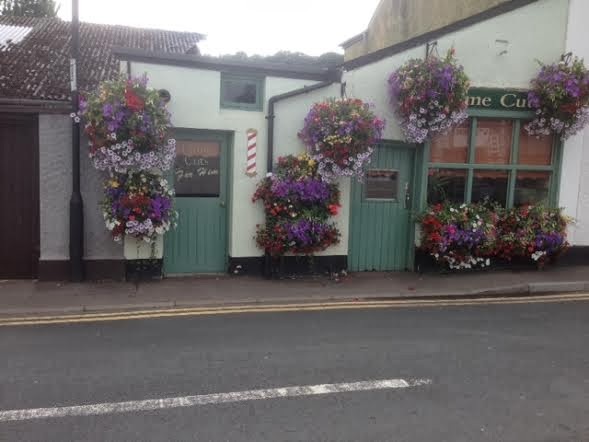 'Bunnings Building Supplies' are still open, but they operate from a yard just around the corner in New Market Street opposite what was 'Latham's Butchers' shop - now a hairdresser's 'Prime Cuts' - which also wins prizes for it's floral displays and you can see why in this photo taken August 2013! 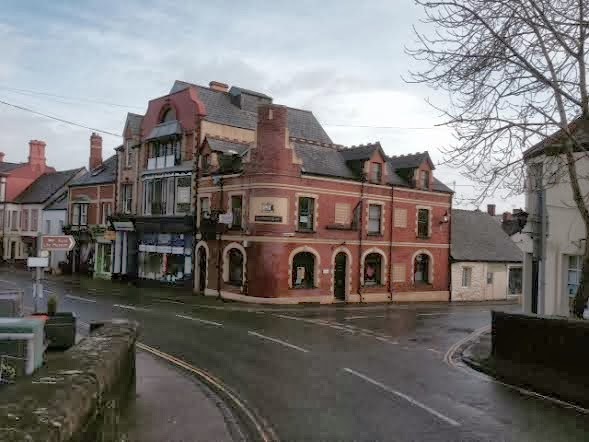 Other former 'commercial' properties are now residential dwellings and other buildings have been demolished and the sites redeveloped including the 'Beaufort Arms' (later known as 'The Bridge Inn') which once stood on the bottom corner of Bridge Street opposite the Police Station on the site of what became a Council yard and is now the Usk Bridge Mews residential development. 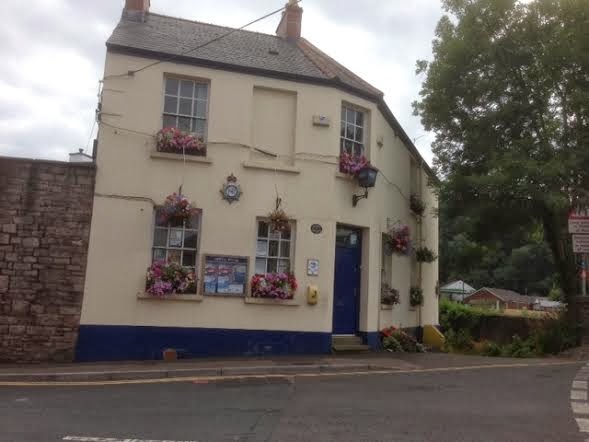 In a later post I will look at some of these properties in greater depth including some of the many Inns that Usk once had which have now closed. 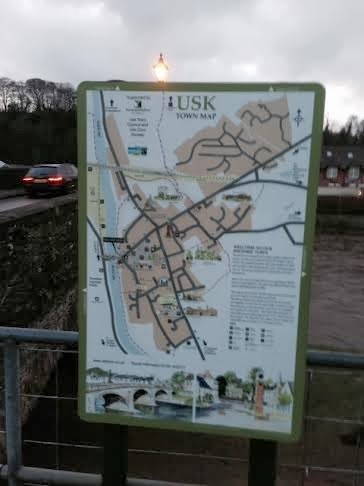 As you might expect, Usk Bridge features on the Usk Town Trail map which provides residents and visitors to Usk with a numbered trail with interesting facts, to follow around the town. 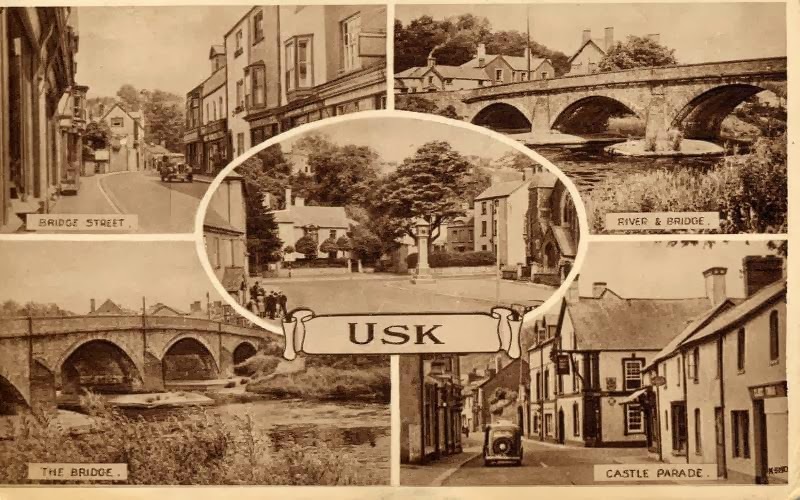 I will be featuring other points of interest on the Usk Town Trail in other posts over the coming months. 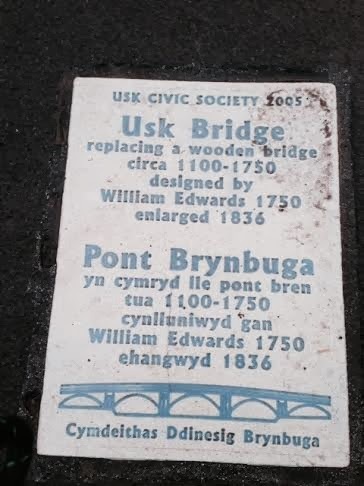 The bridge also has an information plaque set in the footpath.